I was fortunate to visit China recently and take a few Wing Chun classes with sifu Yang Zhan (杨湛) at his school in Chengdu, Sichuan - China (成都, 四川 - 中国). 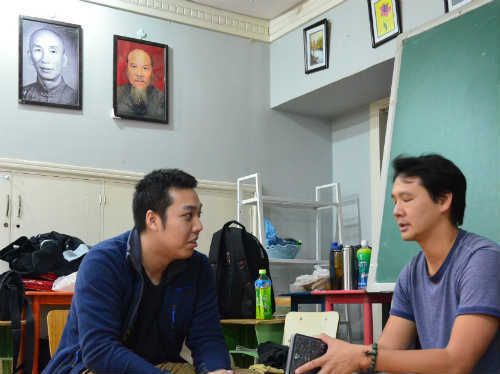 Before I returned home we sat down for an interview and I discovered a number of interesting details about him and the state of Wing Chun in China. Before we continue, I'd like you to ask yourself one simple question. Do you Lian (练功夫) Wing Chun or Wan (玩功夫) Wing Chun? It'll make more sense as you go through the interview. Sifu Yang has formally trained kung fu for over 20 years and got his start as a child. His father and grandfather are both Hung Gar artists. He followed in their footsteps, but by age 14 he switched to Wing Chun. Originally from Chengdu, Sichuan (where the pandas are from), he grew up and spent many years in Foshan, Canton (Guangdong 广东) where he picked up Wing Chun. "I had many friends studying Wing Chun so I started practicing, too," sifu Yang said. "I started with Foshan Wing Chun. Wing Chun became very popular in the 1990s. But before that Hung Gar was the predominant martial art studied in Hong Kong, Foshan (佛山), and Guandong (Canton 广东) province." Foshan Wing Chun is a line that comes directly from grandmaster Leung Jan (梁贊 Liang Zan, father), and passed down to Leung Bik (梁壁 Liang Bi, the son), and Leung Xing Pai (梁心培 Liang Xin Pei, the grandson). Sifu Yang studied under, sifu Ling Tao (林涛), who learned from his own father. He studied under sifu Ling for 5 years and only stopped because he passed away. "After sifu died I took some time off from studying martial arts formally and worked as a stuntman and fight choreographer in Kung Fu movies," he said. Eventually, his friends introduced him to Wing Chun grandmaster He Jin Ming (何金铭). Pictured in the first photo above, to the right of Ip Man's portrait. "Grandmaster He was a direct student of Ip Man. He studied about the same time as Bruce Lee and William Cheung (1953 ~ 1956), but he was older because he started at a later age, 30 years old." Sifu Yang hung out and visited grandmaster's school. Yang hoped to be accepted as a direct student, but grandmaster thought he was too young; about the age of his 'grandchild-students'. Instead, grandmaster He introduced sifu Yang to one of his own direct students, sifu Lei Ming Hui (雷明辉). Sifu Lei accepted him and became sifu Yang's second Wing Chun teacher. This new line belonged to Ip Man, or Ip Man Wing Chun. Yang quickly realized that this lineage was different from his last one (Foshan Wing Chun under Ling Tao, 林涛). "Ip Man altered a lot in Wing Chun, including its teaching methods and vocabulary," explained Yang. It could be said Foshan Wing Chun is more archaic and rigidly formal. "Ip Man relaxed it by removing all the heavy fluff." Sifu Yang also confirmed that Ip Man moved to Hong Kong from China and started teaching Wing Chun. As he got older, Wong Shung Leung was the main teacher (Leung Ting was one of Ip Man's last students, ~1968). "However, Ip Man, even when older, would still give private lessons." Around 2006 sifu moved back to Chengdu. His original plan was to teach Wing Chun and develop a stunt team from the students. But it didn't pan out as he planned. His greatest challenge in the beginning was securing a good location for classes. "My first school was in a residential area." But within the first year he had to move out because of the noise complaints from the classes, his two wooden dummies, and weapons training. The second location was at the local college, Sichuan University. But as soon as the summer came most of the students dropped off, and when the university reopened in the fall, he had to rebuild attendance all over again. He decided to take a break from teaching. But a few past students called him for lessons. He decided to meet them on university grounds for friendly and informal classes, at no charge. Through word of mouth, these informal classes grew to about 20 students in a few months. What do you and your students find most difficult about Wing Chun? "Most students come to the school because they're influenced by T.V. and film… I have to correct their idea of what real Wing Chun is." He learned marital arts in the old, traditional way, a lot of discipline, never questioning his sifu, and perfecting his techniques. "That's how I grew up," he said. He started martial arts when he was 10 years old and spent 4 to 5 hours a day training -- every day. "Kung fu deserves strict discipline. However, I've visited other schools and saw that they're more relaxed." "In Chengdu they say, 'I -Lian- Wing Chun (练咏春).'" "In southern China [Foshan/Hong Kong/Canton] they say, "I -Wan- Wing Chun (玩咏春),'" sifu explained. A direct translation would define 'Lian' as 'to practice', and 'Wan' as 'to play'. But the feeling of those words in Chinese is more profound. To 'Lian' Wing Chun implies you practice or train to gain some direct benefit. In today's world, it may be understood that you want a quick benefit. But to 'Wan' Wing Chun implies you do it for enjoyment. You do it as a way of life; it's part of who you are. "In the south of China they follow more traditional rules. But in Chengdu and other cities, since we're farther away from the grandmasters, you'll find Wing Chun schools mixing in other martial arts," Sifu Yang explained. "This has to do with marketing, and can lead to funny Wing Chun... They [most students] want to practice and learn quickly, but I feel it should be a way of life." What are your feelings about Wing Chun as Art, in Competition, or Self-Defense? "Most students come for self-defense, attacking. That's okay because it's a part of kung fu," explains sifu. "There's style and skill, sparring, and fighting with a lack of art." "Wing Chun should put them together; fighting with skill." But how and when to teach fighting depends on the student and the teacher. A lot depends on the student's skill. "I can't teach a student how to fight if he doesn't know the basics," sifu commented.